I have a great post coming up for you today from Tanja at Journey of a Substitute Teacher. She’s sharing some great ideas for math centers that she’s seen in her subbing journey. I use Powerpoint to display my centers rotations for my students. This has made centers go SO much more smoothly. To see more about that, click the image below to head to that post. I also have a TON of resources (lots of freebies!) that can be used for math centers in my TpT store. See more here. If you do math centers in your classroom, keep reading! Hi everyone! This is Ms. T from Journey of a Substitute Teacher. I’m glad to be here today guest blogging for Tessa. Thanks Tessa! Today I’m going to be talking about math centers and math practice. It doesn’t seem to matter what grade I’m in, what class, or what students, they all need extra math practice and math centers are a great way to get it done. I’m a fan of math centers, that’s for sure! So there are some ideas of math center storage and organization! If you are following along a math guide like Bridges or Everyday Mathematics, you have a topic you have to teach, whether it is addition, fractions, money, place value, etc. 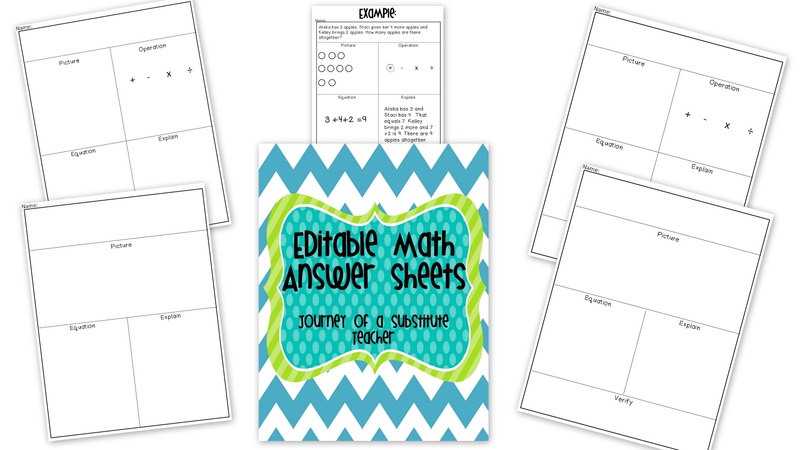 With Teachers Pay Teachers and Teachers Notebook, it’s easier than ever to supplement your math centers! In one class I sub for, the teacher has rotations every 10-15 minutes for 5 centers. One 3rd grade teacher that I know that has centers has about 10 centers, students go to 2 and switch after 15 minutes. She makes up a lot of her centers to supplement what they are learning and the kids seem to enjoy them a lot. I was inspired by one of her centers and did my own spin on it. I love that students have to figure out the operation, draw a picture, and write the equation. My pack includes a few varieties of this form. And it’s editable, so all you have to do is type in the problem at the top of the paper and print! And it’s a freebie in my stores : TpT and TN.